CHICAGO—Honoring his many achievements both on and off the field throughout his glittering career, the Phillie Phanatic was officially inducted Monday into the National Italian American Sports Hall of Fame. “For 28 years, the Phanatic has excelled at the highest level of professional baseball while also embodying the ideals and values of the Italian-American community, and it is our great pleasure to welcome him into the Hall of Fame Class of 2016,” NIASHF director George Randazzo said during a ceremony at the organization’s museum where a bronze bust of the green-furred creature was permanently installed between portraits of boxer Arturo Gatti and University of Connecticut women’s basketball coach Geno Auriemma. “The Phanatic began his career at a time when ugly stereotypes of Italians still lingered in our society, but with grace, courage, and skill, he preserved and represented his heritage with distinction, all while paving the way for the next generation of Italian Americans who may wish to follow in his footsteps. 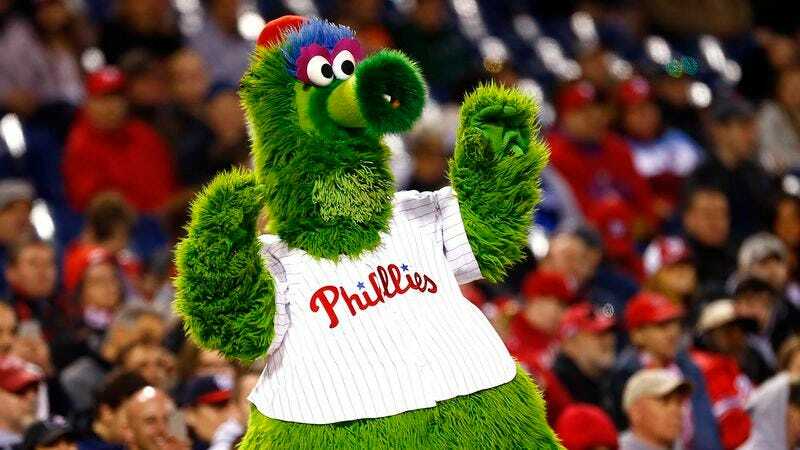 We at the National Italian American Sports Hall of Fame are extremely proud to call the Phillie Phanatic one of our own.” According to sources, the induction comes just months after Cambridge Rindge and Latin School in Massachusetts renamed its gymnasium after the Phanatic to honor his outstanding high school career.